Anyone who has even a passing interest in jazz music should know who Charlie “Bird” Parker is. And for those of us who are inspired by his music should be interested in a biography really letting us know he was. Sadly, this book doesn’t give us too much. In one paragraph: Charlie “Bird” Parker was focussed on two things. His music. Getting high. He had exceptional talent, played with lots of famous people, but was addicted to drugs and died from that addiction. There are a lot of familiar names in the book. People whom Charlie played with or was at least contemporaries with, who are mentioned quite regularly, and are very recognizable names in jazz music. But never once did I get an impression of what Charlie thought of these people. While a biography typically works best in a time-line format, there isn’t much here other than a listing of where he played and who he played with. In his early days, we do learn about a doting mother and a girl-friend/wife whom he abandons to travel across the country and play music, but even these early days are filled up more with when he played certain gigs or how he talked his way in to the gigs. But for me, what I hope to get out of a biography is what made the man tick? What shaped his future and his abilities? Where did he develop the drive to play the way he did? Most of these questions are not answered, and those that are, could just as easily have come from watching the Clint Eastwood film, Bird. I look for a biography to tell me a little something about what made the man (or woman) who he (or she) is. What can we find in his past or his education or his upbringing that was special or a trigger to bringing out the talent for which he is known. In this biography we do get a little information on his school days and that he practiced his horn a lot. Possibly as much as eleven hours a day. But we also learn that others thought of him as lazy. Charlie was even fired from some of his early gigs. And while we come to understand that humiliation was the motivation for Charlie to improve,we only learn that he practiced a lot (and got married) and returned to the bands a stronger musician. “When he came back, the difference was unbelievable.” … “…six months before he had been like a cryin’ saxophone player.” Equipped with his new alto, seventeen-year-old Charlie became an in-demand soloist on Twelfth Street. What did he find? What brought about not only a change but the sudden rise to stardom? Was it simply a lot of practice? Or did he suddenly discover something about music, or his horn, or himself? This missing piece of information seems crucial to me. At times I felt there was a little too much listing of names and songs. It’s likely the easiest information to track down, but it started to sound as though what identified Charlie Parker was not himself, but the people he knew and the songs he played. There’s a lot of information here and I appreciate the research that went in to this book, though I’m disappointed at what’s missing. Looking for a good book? 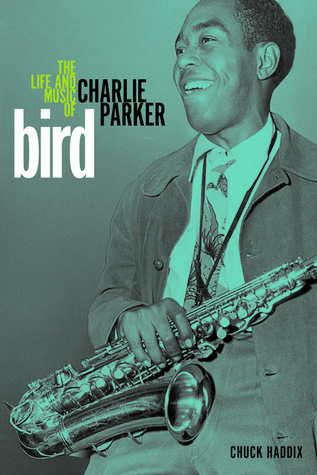 Bird: The Life and Music of Charlie Parker is a nice look at a jazz legend, though it misses a few crucial points in his life.